One man with his 'conscience captive to the Word of God' in defiance of the authority of the pope and centuries of Roman Catholic tradition. Who on earth did Luther think he was? His monumental arrogance spawned a terrible horde of lonely individuals who insisted that their conscientious reading of the Bible was the only authority that mattered. A recipe for theological confusion and ecclesiastical division. As Vanhoozer puts it, "Wittenberg, we have a problem." But it was never the intention of Luther to assert the authority of the individual believer over and against the church. Rather, he wished to place the church back under the critical authority of Holy Scripture. 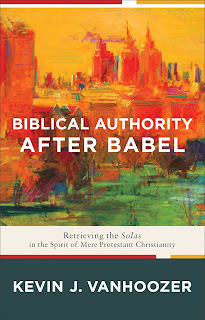 Vanhoozer's purpose in this work is to bring out the correlation of the Reformation battle cry, 'Scripture alone', and the other 'alones'; 'grace alone', 'faith alone' and so on. 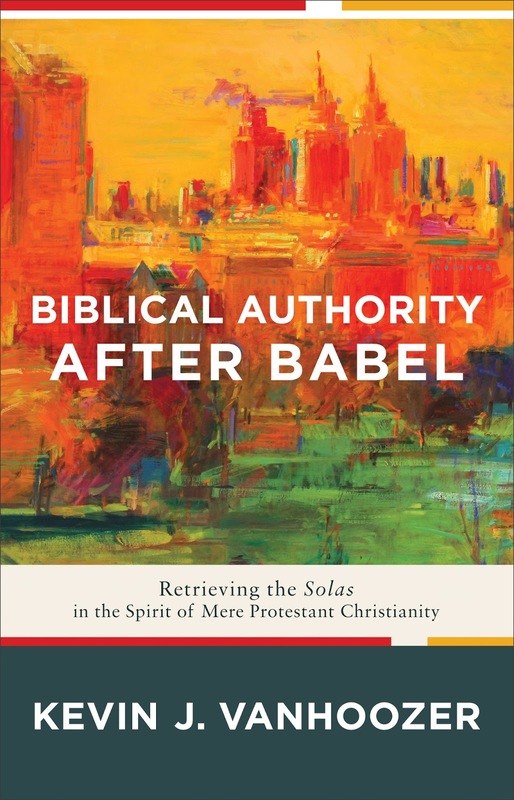 Flowing from his 'mere Protestant' account of solo gratia, Vanhoozer locates the principle of authority over the church not in the believer with Bible in hand, but in the Triune Lord of the gospel. God alone has rightful power over his people. And it is only in subjection to his authority that true freedom and human flourishing are found. Protestantism is not the reassertion of Adamic epistemic autonomy, "I will decide for myself what to believe". Authentic Protestantism is the product of trust in the self-authenticating witness of Scripture as it discloses what Jonathan Edwards called "the great things of the gospel". This saving trust is the result of the internal testimony of the Spirit who works by and with the Word to give the gospel its faith-compelling power. As Luther put it, the church is a "creature of the Word" because by the Spirit "the Holy Scriptures..are able to make you wise for salvation through faith which is in Christ Jesus" (2 Timothy 3:15). Faith alone in Christ alone according to the witness of Scripture alone draws a person into the church over which Jesus rules by his Word. The church is an interpretive community that exists not to make of Scripture what it will, but to be shaped by the Bible according to God's will. Her calling is to attend to what the Holy Spirit is saying in the Scriptures concerning what is in Christ for his people. If God is our Father, the church is our mother whose role is to nurture the faithful to maturity in Christ. The Bible alone as God-breathed Scripture commands magisterial authority over the church, but the church as a holy nation and royal priesthood has ministerial authority to teach the Word. This involves thinking God's thoughts after him and talking God's talk after him. 'Faith alone' is not 'me and my Bible alone'. Rather it involves the community of those who have been justified by faith alone being summoned by the Spirit to "respond to the voice of the Triune God speaking in the Scriptures to present Christ." (p. 104). It takes the whole of the people of God even to begin to grasp the meaning of the whole Word of God as it speaks to us of what is in Christ, Ephesians 3:18-19. The church as an interpretive community does well to read Holy Scripture in the context of the catholic church, with an awareness of the way in which the Spirit has led the people of God in their journey of faith seeking understanding over the centuries. The problem the Reformers had with the Roman Catholic Church was that she made herself the 'norming norm', usurping the authority of Jesus, and fatally compromising her place in the catholic church. Adding to what is in Christ as he comes to us clothed in Scripture leaves us with a Saviour who is less than a sufficient prophet, priest and king to his redeemed people. Placing biblical interpretation in the context of sola fide orientates the church towards the gospel promised by the prophets and announced by the apostles. It helps preserve the church from slavery to 'the assured results of modern scholarship', where human intellectual ability is asserted over and above the Word. It also acts as a safeguard against postmodern skepticism that despairs of finding any true meaning in the Bible. Rather than falling prey to these twin idols, 'the tower' and 'the maze', the church is summoned to trust in the God who is there and is not silent. We recall the words of Paul, "faith comes by hearing, and hearing by the word of God." (Romans 10:17). As a royal priesthood and holy nation the people of God are called to attend to the Word with the expectant prayer, "Speak Lord, for your servants hear". To which our God responds, "This is my beloved Son, in whom I am well pleased. Hear him!"